With a growing community of residents and workers and an ever increasing number of events in the South Lake Union neighborhood, Vulcan Real Estate wanted to develop a platform to both reach out to their residents, but also foster the community by promoting events, businesses, and restaurants in the South Lake Union area. DiscoverSLU.com was set up to do just that. The site features a fully interactive CMS allowing anyone in the community to post events and business offers while seeing all the happenings in the area. In conjunction with the site, a weekly email newsletter was developed to keep in contact. Each newsletter showcases a feature story about an event in the area followed by upcoming events, SLU Card offers, and a “Home of the Week” showcase. 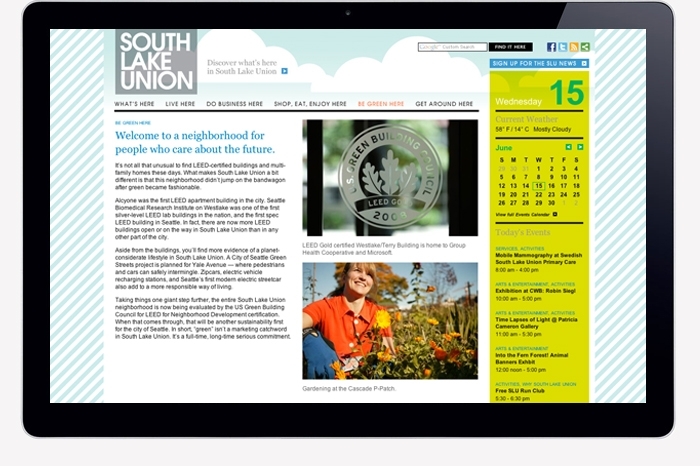 A full integration of the newsletter to site allows for a streamlined workflow while also driving users to the Discover SLU website.